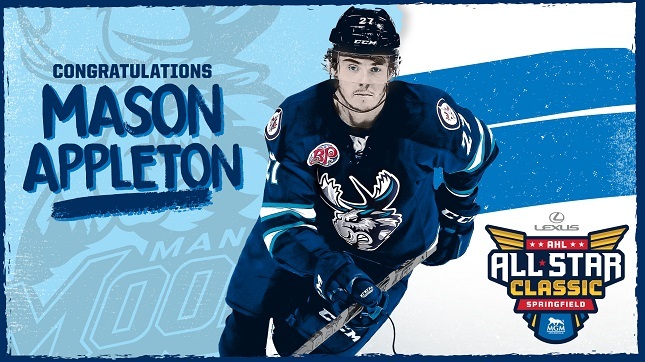 Winnipeg, January 3, 2018 – The Manitoba Moose Hockey Club, in conjunction with the American Hockey League, announced today forward Mason Appleton has been named to the 2019 Lexus AHL All-Star Classic presented by MGM Springfield on Jan. 27-28, 2019 at MassMutual Center in Springfield, Mass. Appleton, 22, has 18 points (8G, 10A) in 19 AHL games this season after leading the Moose with 66 points (22G, 44A) in 2017-18. It’s the second all-star nod for Appleton who attended the event in 2018 in Utica. The Green Bay, Wis. native was voted the AHL’s Outstanding Rookie for the 2017-18 season and named to the AHL First All-Star and All-Rookie teams. Appleton is currently skating with the Winnipeg Jets while recording two points (1G, 1A) in 14 NHL games. 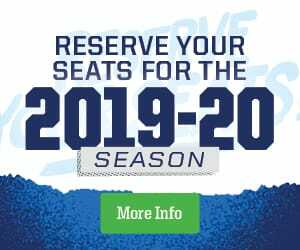 The 2019 AHL All-Star Skills Competition on Jan. 27 (6 p.m. CT) will pit the All-Stars from the two Eastern Conference divisions against those from the two Western Conference divisions in seven skills events. In the 2019 AHL All-Star Challenge on Jan. 28 (6 p.m. CT), the four teams will participate in a 3-on-3, round-robin tournament featuring six games of 10 minutes each. The two teams with the best records at the end of the round-robin will face off for the championship, a six-minute, 3-on-3 game. Since 1995, more than 94 per cent of All-Star Classic participants have gone on to compete in the National Hockey League.